Bus from Singapore to Tanjung Gemok is only transport in Singapore to the jetty. Tanjung Gemok jetty is popular because it is the gateway to Tioman Island. Many diving lovers in Singapore travel to Tanjung Gemok to take ferry to Tioman Island every year between March and October. 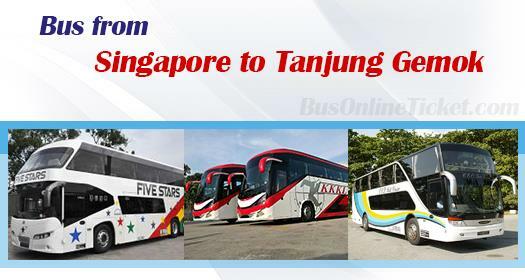 The One Travel, KKKL, and WTS are the only three bus companies serving bus from Singapore to Tanjung Gemok. Both The One Travel and KKKL operates the route with VIP bus while WTS deploys standard 40 seater coach. VIP bus offers more comfortable journey to passengers because of its spacious seat layout. Many travellers used to go to Tioman Island via Mersing Jetty. However, many travellers are gradually changing to Tanjung Gemok Jetty for ferry to Tioman Island in recent years because ferry service in Tanjung Gemok Jetty has more stable departing schedule than Mersing Jetty. Ferry schedule in Tanjung Gemok has much lesser influence by sea tidal condition and therefore ferry schedule is usually on time. The bus fare from Singapore to Tanjung Gemok is ranging from SGD 30.00 - SGD 36.50 depending on bus operator. Bus fare could go higher during long weekend and school holiday. The trip duration from Singapore to Tanjung Gemok takes about 4 hours depending on traffic condition. Due to high demand for bus service from Singapore to Tanjung Gemok, passengers are advised to booking online early with BusOnlineTicket.com. With convenient online booking service and choices of bus operators and boarding points, this makes BusOnlineTicket.com become one of the most popular online booking portal among its customers throughout these years.